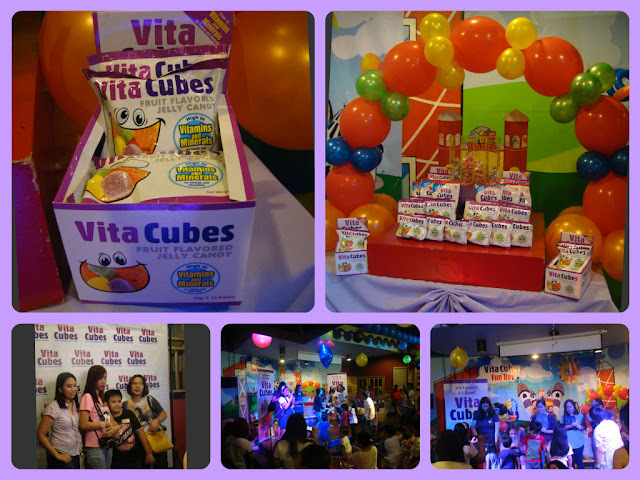 Last Sunday mom and kids were given a special treat by Vita Cubes at Fun Ranch, Ortigas. Vita Cubes prepared so many fun activities for Mommy Bloggers Philippines members and their kids. Our eyes feasted on the brilliant hues of violet as soon as we stepped inside the Red Barn. At Vita Cubes Fun Day event, I discovered that Vita Cubes is the "healthy choice” I've been looking for. You see, my daughter and I share the love for sweets and I've long been looking for a replacement that’s just as fun and tasty. Vita Cubes are delicious fruit-flavored jelly candies that are high in vitamins and minerals. It comes in 2 pack sizes, one with 5 different flavors per pack and the other individually wrapped jelly candy. These chewy candies have a similar taste and texture to more traditional gummy bears. These candies certainly make taking in vitamins a lot more enjoyable for growing kids! It is something I could give to my child and feel good about it knowing that she is eating something healthy. It's yummy, it's good, it's Vita Cubes! Vita Cubes made everything perfect and unforgettable from the beginning to the end of the party. Games, Raffles and Magic Show seamlessly mixed entertainment and fun in one! Fun Ranch's indoor playground slides and climbing equipments added the extra excitement! Thanks to Vita Cubes for a truly special experience!